The Arab Republic of Egypt or simply 'Egypt' is located in North Eastern Africa and is bounded by the Mediterranean and Red Seas. Egypt is well known for its pyramids, ancient temples and ofcourse mummies. Egypt is called as the 'Gift of the Nile' and rightly so because only the region along the path of the Nile is green and hospitable. The further away one goes from Nile, the more dry and barren the land becomes. Cairo - Apart from being the capital of the country, Cairo is also home to the Giza Pyramids, the Great Sphinx, the Mosque of Muhammad Ali Pasha or Alabaster Mosque, the Egyptian Museum and many coptic churches. The city also has the famous and lively Khan el-Khalili bazaar. If it is a modern mall that you are interested in, then head to the Mall of Arabia - the largest mall in Cairo. Saqqara - Famous for the Saqqara necropolis which houses the Step Pyramid or the Pyramid of Djoser. Aswan - Located in the south of Egypt, Aswan has a lot to offer to the tourists. The Philae temple, Abu Simbel, The High Dam of Aswan, Monastery of St Simeon, Elephantine Island, Aswan Botanical gardens, the Unfinished Obelisk and the Nubian museum are some of the attractions in Aswan. 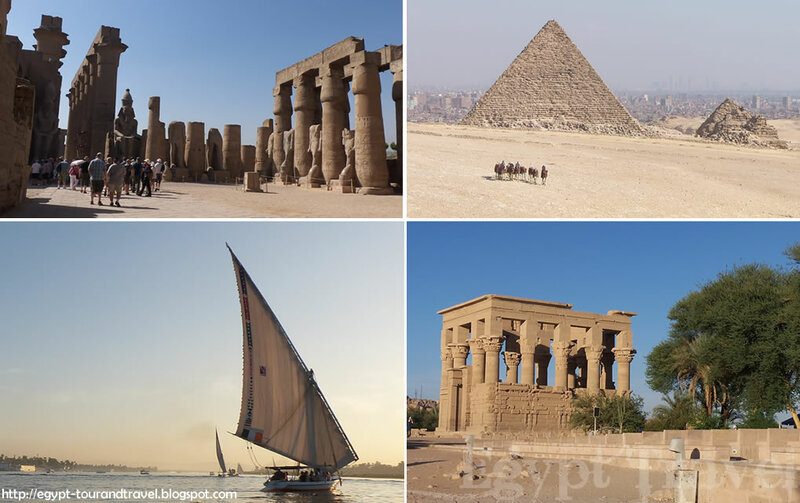 Luxor - This city has so much to offer be it spectacular desert views or the temple complexes of Luxor and Karnak, the Medinet Habu, the Tombs of the Nobles and the impressive Valley of the Kings. You could also do a hot air balloon ride over Luxor taking in all the important landmarks with an unobstructed view. Another temple complex not to be missed is the Temple of Hatshepsut. Abu Simbel - Located close to the Sudanese border, this little settlement is famous for its temples - at Temple of Ramses II and the Temple of Hathor. Hurghada - This coastal resort town is most visited by those who enjoy diving, snorkelling, parasailing and other such activities. You can go quad biking into the desert, visit a Bedouin village or do a boat trip to the Giftun island. And just enjoy the nightlife the town has to offer. Sharm el-Sheikh - Also called the 'City of Peace', this city is very popular with tourists and is one of the finest diving spots in the world. There are many diving centres offering daily diving tips and also PADI courses for those who wish to do the course. You can go para sailing or quad biking or camel trekking. One will never get bored in Sharm el-Sheikh. Dahab - famous or rather infamous for the 'Blue Hole' - one of the top ten diving spots in the world, Dahab is extremely popular for diving and freediving. There are innumerable diving centres in Dahab. Apart from diving you can also try Desert excursions and trekking, sandboarding, rock climbing or wind surfing in Dahab. Alexandria - Egypt's second largest city, it has a lot of historical monuments like the Citadel of Qaitbay, Kom el-Shouqafa, Pompey's pillar and the Presidential palace. Montazah Royal Gardens are also worth a visit.